With the election of Donald J. Trump as president of the United States, the world is now awash in uncertainty. For those preoccupied with international relations, the uncertainty is particularly acute, as so little is known about Trump’s views on foreign affairs or how his idiosyncratic approach to politics and public discourse will play out on a global stage. For Asia, Trump’s brief but unprecedented phone conversation with Taiwanese President Tsai Ing-wen on December 2 may be a harbinger of upheavals to come. As leaders around the world brace themselves to deal with Trump, the role of diplomacy is set to become more important than ever. Included are an analysis of China’s approach to relations with the US, by Huang Jing at the National University of Singapore; a call to use strategic diplomacy to break the nuclear deadlock with North Korea, by Bong-Geun Jun at the Korea National Diplomatic Academy (KNDA); an examination of the role of US-China rivalry in the effort to denuclearize North Korea, by Brendan Taylor at ANU; an exploration of German reunification’s lessons for Korea, by Jochen Prantl and Hyun-Wook Kim at KNDA; a look at the complexities of Taiwan’s diplomacy in the context of Asia’s history contests, by Amy King at ANU; an analysis of what Trump might mean for the Northeast Asian security order; by Bruce J. Jentleson at Duke University; and an argument by Evelyn Goh for a new grand bargain between China and the US. Our Features section showcases an appeal - some may call it idealistic, but we feel otherwise - for a global Constitution of Information to govern the risks of today’s frightening, Internet-driven epistemology; a look at the dynamics that led to the impeachment of South Korean President Park Geun-hye and what it says about the state of the country’s democracy; two articles on the continuing maritime disputes in the South China Sea, one pointing to the US as an aggravator and one suggesting a role for India as a mediator; and an assessment of the prospects for democracy in Thailand under its new king. Our In Focus section looks at how Trump’s apparent withdrawal of the US from the Trans-Pacific Partnership (TPP) trade agreement could rewrite trade policy for Asian nations, especially China, Japan and South Korea. It appears increasingly likely that China will become the regional rule-maker on trade policy through the Regional Comprehensive Economic Partnership, a lower-standard alternative to the TPP. 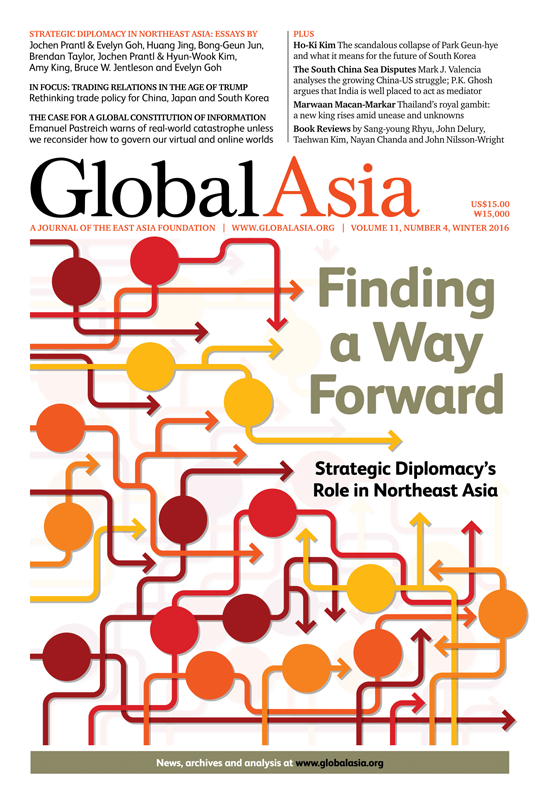 As always, we hope you enjoy this issue of Global Asia. Strategic choices are crucial, and political integration needs to drive the strategic diplomacy of Korean unification. What is strategic diplomacy and how can it reinvigorate analysis and understanding of policy issues in the region? At the core of China’s thinking is its effort to use global partnerships to define a new type of relationship with Washington. Getting past the policy blunders that have seen the world fail to halt Pyongyang’s nuclear ambitions. Amid heightened maritime tensions, relations appear headed toward greater competition, including on the Korean Peninsula. It offers a lens to analyze how Taiwanese elites have constructed and use historical memory. A measured approach to this vital region by the US is necessary in this time of transition. Is a ‘Grand Bargain’ the Way Forward in Northeast Asia? The US-led post-war regional order is disintegrating, and Washington and Beijing must forge a new understanding. Rapid advances in technology, growing ability to manipulate digital information and the emergence of virtual reality are posing existential questions for human civilization. The influence-peddling scandal’s origins lie in the authoritarian past, and the eventual outcome may cause the country to enter a new era of genuine reform. An arbitral ruling against China in its dispute with the Philippines over the South China Sea has unleashed a cascade of reactions that could see US influence in the region diminish. A rising power in the Indian Ocean, India should be well suited to mediate given its growing strategic aspirations and rising capabilities. But would it be allowed to? Economic woes and the military junta’s stranglehold on political discourse and free speech continue to make the country’s future difficult to discern. Whither Trade Policy in Northeast Asia? With the TPP in trouble, what are the options? The future is unclear. Can America again provide leadership on trade, or will it abdicate this role to China? With uncertainties over TPP and RCEP, Japan must work with its neighbors to tap its potential. The need to review the TPP, changing regional architecture and a role in future mega-FTAs. Park Chung Hee and Modern Korea: The Roots of Militarism, 1866-1945.